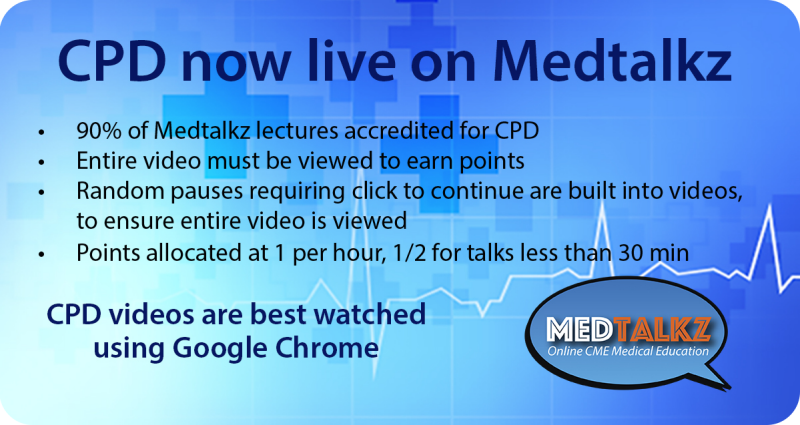 Earn CPD points while watching Medtalkz lectures. Welcome to Medtalkz, South Africa’s new open access medical education channel. The health profession in South Africa is privileged to have an active CME landscape with excellent speakers and content. But this valuable content only reaches those who attend the event. Thanks to Medtalkz, these world class presentations and talks are now being recorded, stored and safeguarded in the interest of medical education now and into the future. The Medtalkz repository houses hundreds of talks across all fields of medicine. This content is catalogued and is easily searchable using, title of talk; speaker; keywords; or, the name of the institution or society hosting the event. Medtalkz content is provided FREE to all South African health professionals in possession of a council registration number. The views and opinions expressed by any individuals during these lecturers are their own and do not necessarily represent the views, opinions, or positions of Medtalkz. The site, and all materials contained on it or affiliated to it were produced in good faith for educational purposes for health professionals. Although reasonable efforts have been made to ensure the information contained in these lectures was current and accurate at the time of publication, neither Medtalkz, nor any individual who has provided content or been involved in the presentation of this material, can guarantee that all information is accurate and valid. We make no assurance that any information from the original recording has remained accurate due to advances in research, guidelines and other standards of care. Please read our Ts and Cs for more.